The beauty, the love, and the unspoken feelings that turn each moment into a memory. Your wedding is a day you’ll never want to forget. W hen choosing a Wedding Photographer, make sure they will narrate the story of your wedding day through photojournalism, creative lighting techniques, and posing that captures the emotions, hopes, and dreams of you and those you’ve chosen to share your special day. 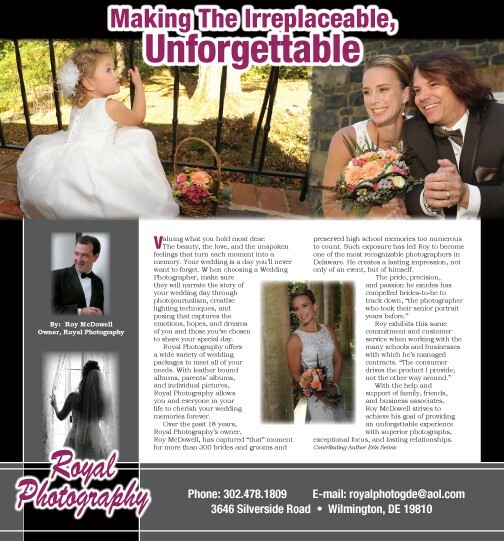 Royal Photography offers a wide variety of wedding packages to meet all of your needs. With leather bound albums, parents’ albums, and individual pictures, Royal Photography allows you and everyone in your life to cherish your wedding memories forever. With the help and support of family, friends, and business associates, Roy McDowell strives to achieve his goal of providing an unforgettable experience with superior photographs, exceptional focus, and lasting relationships.